Purdue head coach Matt Painter and horse racing trainer Todd Pletcher. I think they look alike a fair amount, but I couldn't find any pictures that really drove the point home. 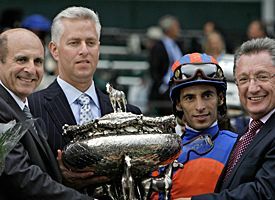 Pletcher looks pensive and wooden (and tanned) in most pictures, while Painter is always screaming on the sidelines or he is smiling placidly for an official (thumbail-sized) photo. But if you see the two of them talking, you'll see the resemblance. Trust me. Here is the best I could do.